Luxury charter yacht STARFIRE stands as a benchmark for comparison in the international yachting industry – a shining example of the harmony of design and technology. The megayacht offers lushly luxurious and sophisticated, spacious interiors, with high-gloss veneers, exquisite wood inlays and elegant Art Deco décor. The motor yacht STARFIRE was designed by Francois Zuretti for the renowned Italian shipyard, Benetti. At 178 feet in length, mega yacht STARFIRE has been through two refits, one in 2002 and the other in 2004. Included in her 2004 refit was the addition of at anchor stabilization, which is a true advancement in the yacht’s performance. This super yacht has the latest and most technologically-advanced communication system in the industry. With a new Ku Band satellite, the luxury motor yacht can now offer full communication whether docked or at sea. This innovative system provides luxury yacht charter guests with high-speed wireless Internet access around the world. Featuring a steel hull and aluminum superstructure, the yacht cruises through at 13 knots, with a top speed of 15 knots. Along with major technical advances, the refit included an interior transformation from a traditional Oriental theme to that of the American Art Deco period. Custom furniture was paired with a collection of exquisite fabrics to create an elegant and inviting atmosphere. Few modern yachts exhibit the elegance, superior finish and sophistication of this Benetti motor yacht. Capable of a “Round the World” cruise, this yacht is engineered to the highest safety standards and is fitted with the latest technical solutions. 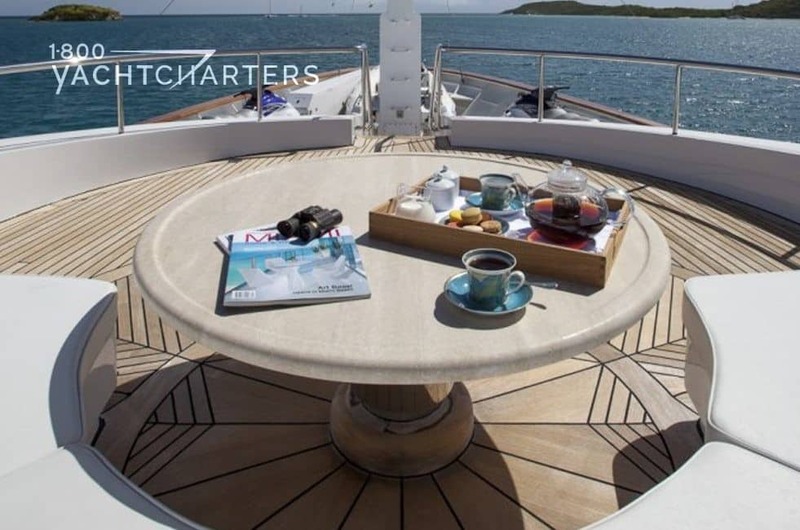 With an excellent crew-to-guest ratio, charter guests are assured the most comfortable and smoothest of voyages, with every convenience virtually at their fingertips. 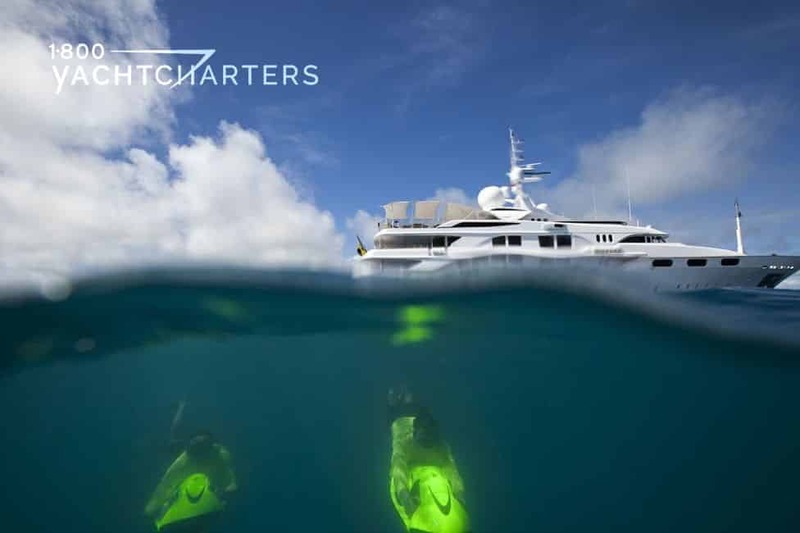 Watertoys are essential to a fun-filled Caribbean yacht charter, and include such equipment as a 36 foot Hinckley tender, four kayaks, waverunners, and snorkel gear. For more sedate relaxation, there is an ondeck Jacuzzi. 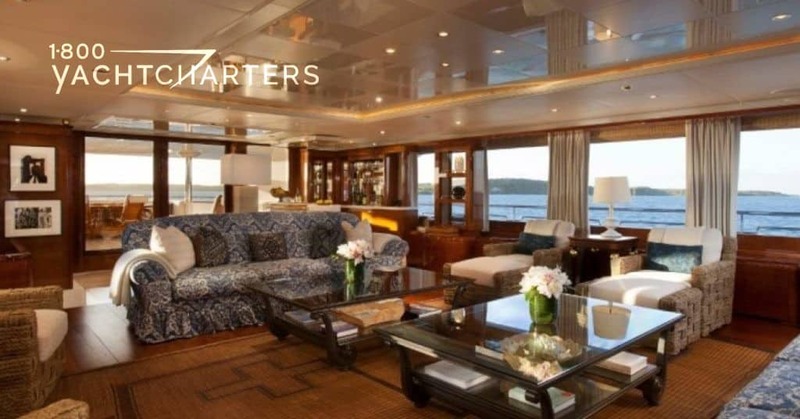 During a relaxing Mediterranean yacht charter, guests often gather in the lounge, and make use of the piano or the large screen TV, and extensive DVD collection. 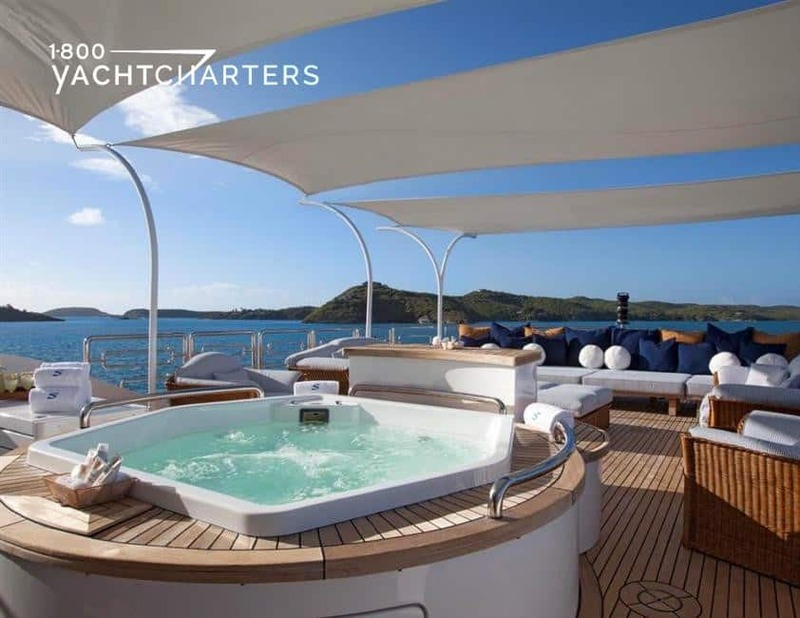 This megayacht has an expansive aft deck – an excellent vantage point for sightseeing. The Main Salon is a cozy gathering place for watching a movie on the hidden plasma screen television. Meals can be served in the adjacent formal main deck dining room. The upper deck salon is also a popular dining area, with 275-degree views and dramatic fiber optic lighting. As to accommodations, guests cabins are tastefully outfitted with fine Italian linens, goose down pillows, and cozy comforters. The full-beam king-sized Master Suite, incorporates a large walk-in closet and dressing space, along with a state-of-the-art entertainment system. The onyx-lined bathroom features a Jacuzzi tub, exquisite detailing and all expected modern conveniences. There is also a private study adjacent to the master cabin. The VIP Cabin is located on the upper deck and features a king-sized bed, full entertainment center, and ensuite marble bath. Four additional guest staterooms are below deck – two queen and two twin staterooms. Each twin stateroom offers expanded accommodations with a Pullman berth (suitable for children). All cabins have ensuite bathrooms and entertainment systems with TV’s. The décor features velvet-covered headboards, decorative pillows in a variety of exquisite fabrics, and marble-topped bedside tables of cherry and lace woods.